What to do, what to see in Phuket? Do not miss the countless activities available on this tropical paradise, diving, shows, trekking. Phuket, Phang Nga, Krabi, Phi Phi, Similan, Surin, Khao Sok, Lanta! Choose your activities and excursions according your taste and let the adventures begin! Phuket tours and excursions your travel tour guide in Phuket, proposes you an overview to discover the island and his inhabitants. This paradise island offers all that you look for to spend unforgettable holidays. If you have already planned your holiday in Phuket Thailand. We are here to organize your holiday, your transfers, Phuket hotels packages, guest houses, excursions…Etc. If you wish a hotel, an apartment, a bungalow, a villa, a house, please don’t hesitate to contact our travel agency. Phuket beaches are particularly beautiful and we offer you a Beach Tour to get you to know the most popular settings of Phuket Island so that you can enjoy your holiday as much as possible. 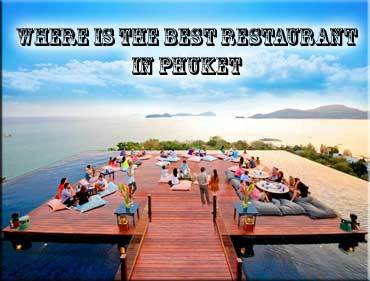 Thailand is well known all over the world for its gastronomy and we offer you a Tour to get you to know the most popular restaurants in Phuket. We are pleased to offer special and easy Packages in Phuket. Adventure, Passion & discovery guaranteed ! Phuket excursions offers you a selection of well organised packages hotels tours at excellent rates with a lot of activities for your vacation such as Trekking, diving, shows, golfs, cooking classes, Quad adventure, beach activities…etc. Although prices are higher, the best way to visit Phi Phi, is the speedboat as it is the surest way to see many things in one day. The islands consist of 2 small islands: Phi Phi Don and Phi Phi Leh but only on phi phi don you can find restaurants and hotels. Enjoy and admire the fabulous Phang Nga Bay, an extraordinary place comparable to Along Bay in Vietnam. Famous for its limestone rocks, Phang Nga Bay shows a complex of deltas, thick mangroves and nipa palm trees growing just to the border of the sea. Khao Lak Province is the ideal place if you want to combine nature and adventure. This region featuring primeval forest and rives can be discovered by rafting or elephant trekking… Come and discover the incredible flora and fauna of Khao Lak. Phuket is rightly called the first destination of South-East Asia. This vibrant island offers so much for every traveler, serenity, nightlife, and culture and many other activities and sensations which will make for your dream holiday. Called, “The Pearl of the South”, it is the biggest island of the Kingdom. Located on the west coast, in the Andaman Sea, it is 48 kilometers from north to south and 21 kilometers from east to west. The island has a chain of mountains along the west coast from north to south and covers approximately 70 % of the Island. The highest of which is May Tha Sip Song (twelve sticks), which is 529m above sea level. The main tourist area of the island is the south part of the island and one of the busiest places to stay is Patong beach where you can do a lot of activities in the day time and enjoy the fabulous night life in the evening. There are other attractive beaches in the area such as Karon, Kata, Kata Noi, Nai Harn beaches and more. In the North part of the island you can find the beaches of Kamala, Leam Sing, Surin, Bang Tao, Naithon and Nai Yang which are more virgin beaches and quiet in spite of the development of numerous hotels and private residences. Their beauty and enchantment are an ideal place for families and nature lovers. Phuket tours and excursions your travel tour guide in Phuket, proposes you an overview to discover the island and his inhabitants. This paradise island offers all that you look for to spend unforgettable holidays. In the incentive field, Thailand is probably the ideal formula, to practice stimulation in enterprises on a large scale. Asia Sensations Travel Co.,Ltd your partner to organizes team building, travel of motivation, your reward or events, conventions, seminars and incentives travel in Thailand. Asia Sensations of Travel Co.,Ltd is a tour operator situated in Phuket. We offer you a know-how recognized by the biggest European TO for the destinations : Thailand and other destination with our partners. Company: Asia Sensations Travel Co.,Ltd. 2000, All Rights Reserved.